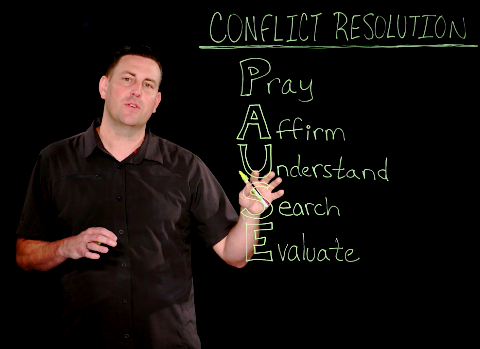 Today, I want to talk to you about resolving conflict. Now, this conflict may be between you and others or between others that you are overseeing. Here is an acronym to help you focus on a biblical resolution. Let’s take a look. First, you have to prepare and pray. Get the facts of the situation. Seek godly counsel. Develop options for resolution and make sure you are prayed up walking in. Next, you want to affirm. Affirm the relationship. Show genuine concern and respect for the person with whom you are in the conflict with and those who may be helping to resolve the conflict. Next, you want to make sure you understand. Understand the interested and the involved. Whoever this conflict is surrounding be sure that you are identifying the concerns of everyone involved. Understand their desires, their needs, their limitations and fears. Then, you want to search for creative solutions. Prayerfully consider the best outcome, keeping in mind what you just uncovered. Finally, evaluate all the options, objectively and reasonably. That might be hard to do, but you want to take a step back and make sure you give it a good evaluation. They key here is to evaluate but not argue. After you have reached a resolution, you want to move forward with the mission at hand. Now that you understand the PAUSE principle in conflict resolution, what are you going to do about it?